In this respect, in HAAPIE 2017 we encourage original and relevant contributions focusing on experiences and lessons learned from real-life applications, current state-of-the-art methodologies, challenges tackled and solutions adopted, tools and services in the academic, public or private sector, studies, theories, techniques, and evaluation approaches that could support human-centered adaptation and personalization issues in various levels of interactive environments. 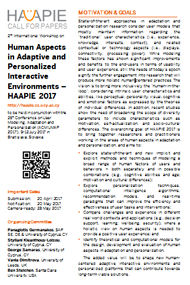 HAAPIE 2017 will be a full-day workshop at the ACM Conference on User Modeling, Adaptation and Personalization (UMAP 2017). The event will be small and specialized on interdisciplinary sessions as a set of oral presentations, and round-the-table (panel) discussions led by key invited persons related to the main theme of the workshop. The workshop will start with a keynote speech of an invited researcher and will consist of technical papers, their commentaries, and a short discussion on the topic of papers. At the end of the day there will be a summary of outcomes and goals for the next such event.